Xiandu Taoist Temple.Once named Marquis Zhao’s Shrine, Xiandu Taoist Temple is also called Marquis Zhao’s Temple or Marquis Wushang’s Temple. As the oldest ancestral temple recorded in Jinyun, it is built to offer sacrifices to Zhao Bing, an alchemist good at medication in the Eastern Han Dynasty. Zhao Bing, who styled himself as Gong’e, was born in Dongyang. He wandered in Xiandu when it is in at war and plague-ridden. At the time, he saved numerous lives by applying magic of wizardry to treat patients. Being grateful for his benevolence, the local people built a shrine to offer sacrifices to him. Since Xiandu was under jurisdiction of Wushang County in those days, Zhao Bing is conferred titles of general and Marquis Wushang by the imperial court. Nowadays, movies and TV series like Monk Comes down the Mountain, The Legend of Flying Daggers and The Legend of the Condor Heroes were ever shot here. Mount Zhutan is right opposite Banyan Village across the river. Zhu Xi, a famous neo-confucianist, gave lectures in Xiandu in 1180 A.D., the 7th year of Chunxi period in the Southern Song Dynasty. He frequently came here in his spare time, boating on the clear lake or strolling about in the mountains. Later, people named the pond Zhutan Pond and the mountain beside the pond Mount Zhutan. 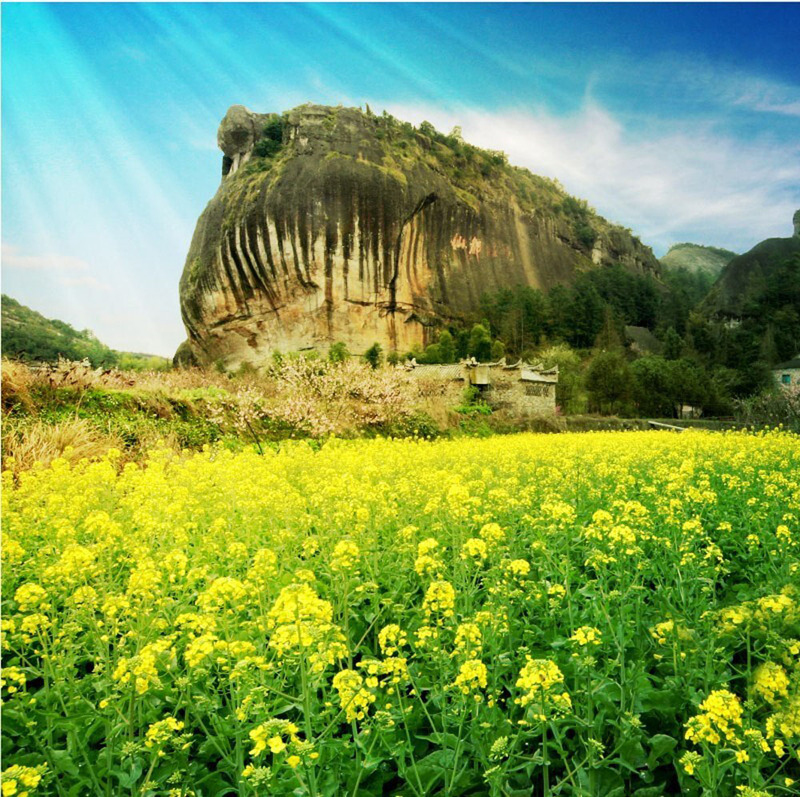 Zhu Xi also styled himself as Huiweng; therefore, there is Huiweng Rock on Mount Zhutan, which is dozens of meters in height and extends over 100 meters north-southward. 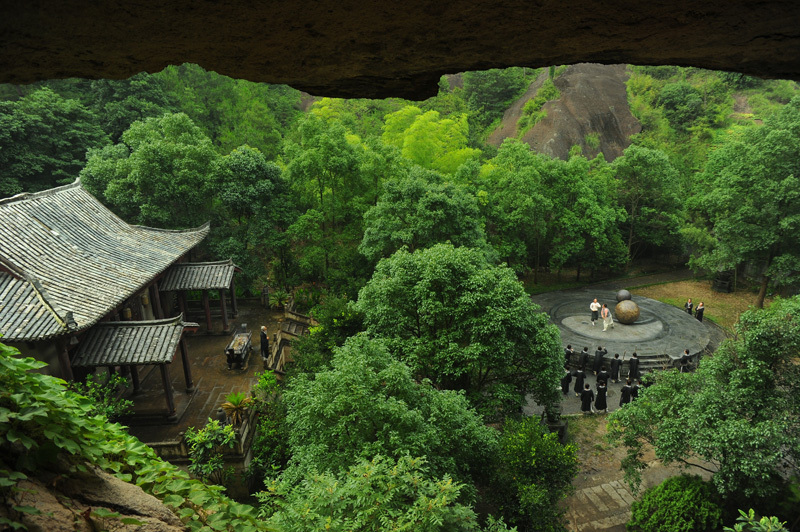 In the middle of the rock is Huiweng Cave, and Huiweng Pavilion was built by the cave. The clear pool, overhanging cliff, pavilion &cave, as well as shades of ancient trees make it a good place for enjoying solitude and self-cultivation. Niweng Cave.It is located at the hillside of Mount Chuyang. Grottoes of different sizes are formed after continuous washout of its protolith, eugeogenous massive magma fragments, by the Haoxi River and crustal uplift. Legend has it that Ni Zi, teacher of Fan Li, lived in solitude here after he helped Yue State to exterminate Wu State. That’s why it got the current name. Some fellow countrymen of the Ming Dynasty ever studied here, including Fan Xianke, a censor; Li Zhi, minister of Penalty Ministry; and so on. There are 60 cliff inscriptions of various generations in the cave. They were all consummate calligraphic arts and showed various character styles. Among them, the stone inscription of Niweng Cave by Li Yangbing, a carving master was of particular value. As quintessence of Xiandu cliff inscriptions, the cave is a key cultural relic under national protection. Dinghu Peak, commonly known as Stalagmite, is also named Solitary Peak and Peak for Alchemy. 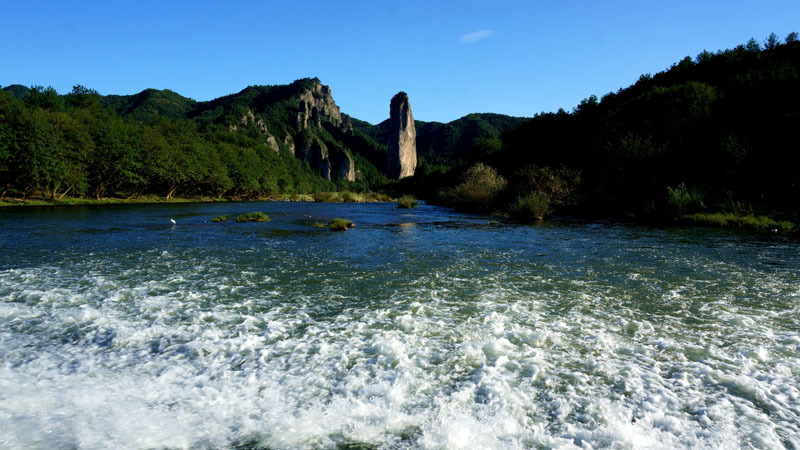 Opposite to Mount Buxv in the east and facing Lianxi River in the west, the peak is 170.8 meters high with a bottom area of 2,468 square meters and a top area of 710 square meters. It, full of masculinity, rises abruptly out of the ground. The spectacular view of the column peak is a result of exogenous geological process on the rhyolite platform that was heaped due to volcanic eruption some 160 million years ago. It is praised as No.1 Peak in the world. Legend has it that Yellow Emperor ever practiced alchemy with a tripod on the top of the peak and later ascended to heaven driving a dragon. The tripod was sunken to form a small lake on the top with clear water that never dried all year around. Thus, it is named Dinghu Lake, i.e. Lake in a tripod. The peak just named after Dinghu.